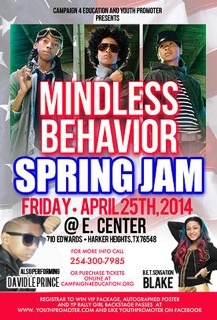 Thirteen Year Old Singer, David Le Prince From Irving, Texas Appears in Two Major Concerts This Month with Diggy Simmons on April 18 at the Mesquite Arena in Mesquite, TX – Followed By a Spring Jam Concert with Mindless Behavior on April 25 in Harker Heights at the E. Center. Dallas, TX, April 11, 2014 /Krista Kelley PR/ – – The youth of America have two exciting opportunities to see one of Texas’ own in concert this month alongside big names like Rev. Run’s son, Diggy Simmons and Mindless Behavior. 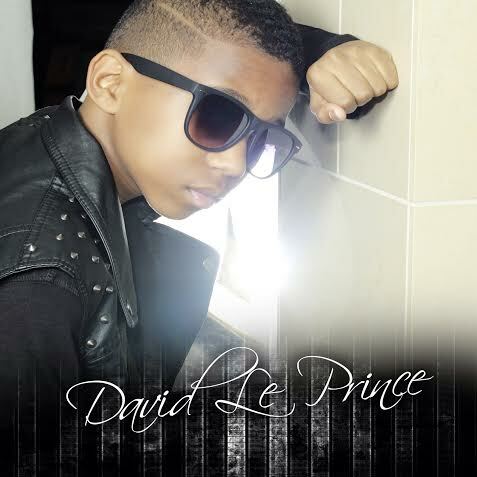 David Le Prince is a thirteen year old singing and dancing sensation from Irving, Texas. 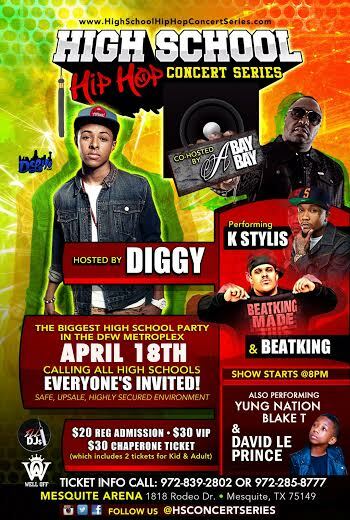 Quickly climbing the ranks, the youngster first shows off his talents at the “High School Hip Hop Concert Series” with Diggy at the Mesquite Arena on April 18th at 8:00 P.M. K104’s Bay Bay co-hosts the event noted as “The Biggest High School Party in the DFW Metroplex.” Tickets start at $20 and ticket information is available by calling (972)839-2802 or (972)285-8777. The Mesquite Arena is located at 1818 Rodeo Drive in Mesquite, TX 75149. The following week, on Friday, April 25, 2014 Campaign for Education and Youth Promotions present the “Spring Jam” concert at the E. Center located at 710 Edwards in Harker Heights, Texas at 7:00 P.M. David Le Prince once again takes the stage, entertaining fans with his “King of Pop” moves and smooth vocals, followed by all-boy group, Mindless Behavior. David Le Prince showcases his latest single, “Where You At” during the concert series. The half-pint’s finesse and flair are quickly sparking attention. Even though he is fresh on the scene, he has two music pioneers-K104’s Bay Bay and George Lopez, the CEO of super group DSR-backing his movement and launching him in a new direction. Fans of all ages are encouraged to enjoy the festivities while supporting their own David Le Prince as he pursues his dreams. 13YR OLD SENSATION OUT OF IRVING, TX. David Luyeye (AKA David Le Prince) was born September 21, 2000 in Dallas, Texas. His mother, Michaella Bonose Luyeye, is from Paris, France, while his father Pat Luyeye, better known as “The Genius,” is of African descent from the Democratic Republic of Congo. At age 3, David moved to Paris with his family, where he resided for 6 years, developing a strong international background. It was in Paris that he learned French. By age 6, David was already teaching himself to sing by watching and listening to Michael Jackson, Usher, Chris Brown, and numerous other singers on You Tube. How could such an amazing talent emerge with no formal training? This could only happen because David was truly a natural. In 2010, when David was 9 years old, his family moved back to Oklahoma City, OK. His dream was to become like Michael Jackson, so he asked his father for help. His father said, “I want you to be a man after your own. Nevertheless, you can model after Michael Jackson and other music icons.” Pat Luyeye gave David his first laptop and showed him how to use media contents like YouTube, VIMEO, and MySpace, so he could learn more about melodies, harmonies, style, and dance. In spring of 2010, the American Mall Model Talent Search was held in Oklahoma City and audiences enjoyed David’s Michael Jackson style footwork. He was signed as a Young Model, but soon after the family relocated to Dallas, Texas. In June 2010, David Le Prince-along with his brother “Tim Fresh” in the background, recorded and released his debut demo album “I Need A Friend.” It’s no surprise that David’s debut album created a strong buzz in Dallas, Texas, in his local community, and among friends and family. “Dance, Dance,” “Rock, Rock,” and “Broken Dream” were recorded on his father’s underground record label “LUYEMPIRE”. These songs were written by Bishop Young Don (Songwriter for Jay Holliday, Genuwine) and co-written by Pat Luyeye “The Genius.” David Le Prince’s sound is broadly inspired by the early Michael Jackson years, Usher, Chris Brown and B2K. But it is described as unique, classic R&B with international French flavor-thanks to David’s time spent in Paris, France. With help from Hip-Hop choreographer Fenton Fulgham, founder of The Revelation School of Dance in Dallas, Texas, David Le Prince’s goal is to be one of the youngest R&B performers/singers of our time. In the summer of 2012, David’s father (whom is also his manager) began to develop David Le Prince as a new crossover artist, taking him to audio engineer and Grammy winning producer, Jay Lacy teamed with Multi-platinum songwriter and recording artist, Tami LaTrell in Houston, Texas. Together, they produced David’s latest single, “Where You At”. 2013 has proven to be a busy year for David starting with the February release of his video “Where you at” on You Tube which received over 100,000 views to date. The release of his follow up single “Girlfriend” received radio play in Connecticut, California, North Carolina, Illinois, Florida & Iowa. In March 2013 David was featured on FlossMagazine.com and Marketwire.com. In June 2013, David opened up for Jay Cole, Ace Hood & Juvenile, on the Dub Tour in Dallas and performed in several other venues in Dallas and NYC. David Le Prince is not just a 13 year old kid that sings in English & French. He is also a dancer, he studies piano, was the MVP point guard on his basketball summer games team in Irving, Texas, won 1st place in 50 meter dash in 5th grade, is an avid video gamer, draws, and paints. In the future, David plans to learn to play other instruments, dive into the acting world and publish children’s cartoon books. He hopes to work with artists such as Willow Smith, Astro, B2K, Mindless Behavior, Justin Bieber and Usher. And while many call him “Baby Usher,” he prefers to be called David Le Prince. Just think, he will only get better and as he grows and so will his fan base.